On the 20th february we had 6 members from pets at home come out to the sanctuary to help us for the day. They were very busy, and got all of our stables and animal sheds painted to protect them from the weather. We would like to say a HUGE THANK YOU to them all for coming. This month we have been busy tidying up around the sanctuary and getting ready for the animals to go out, which we hope will be next month depending on the weather! 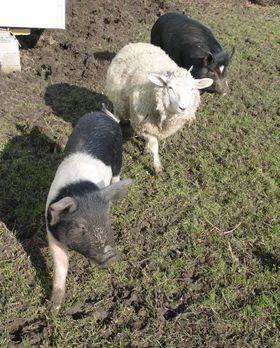 Our newest resident Nick the pig who was rescued after falling off a slaughter lorry. He is now best friends with Penny and Wendy.